When a career working on computers wasn’t everything he envisioned it would be, Rishi Kumar made a switch. A major switch. He was searching for something that made him healthier and stronger. Something that would have a positive impact on society. And on Mother Earth. So, he traded in a high-speed modem for a low-speed shovel and switched from analog to organic. He turned his suburban landscaping into an urban farmscape, converting his childhood house into The Growing Home. 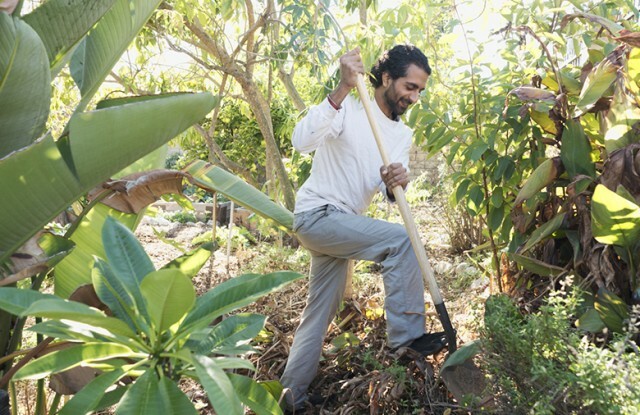 Rishi’s transformation took him from graduating in computer science at University of California, San Diego in 2010 to completing a 7-month apprenticeship at eco-activist Vandana Shiva’s farm in Uttarkhand India within a short period. If those accolades aren’t impressive enough, he’s also a University of California Cooperative Extension Certified Master Gardener, has a Permaculture Design Certificate, a Soil Food Web Certificate and an Urban Ecosystems Agriculture Certificate. Through the question and answer format below, learn how Rishi is taking millenniums worth of farming techniques and revamping them – with a contemporary twist. Urban Farming regenerates urban lands, shifting them to fertile lands where people, plants, animals, insects and all other life can thrive in a community. Urban farming seeks to reunite man-to-earth, neighbor-to-neighbor, life-to-death. How does Urban Farming accomplish this? Healthy food – being a connector of all living beings – creates healthy people. Urban farming provides a way to grow healthy, organic – and beyond organic – local food that is higher in nutrition than foods available at the grocery store or even farmers markets. The second main product is education. Urban Farming creates spaces close to where people live, where they can be regenerated and enriched, and people can once again connect with the riches, mysteries and wonders of nature. How does Urban Farming work? It’s very simple, actually. Find a piece of land, empty wall, unused or underused indoor space and use it to grow something of value: food, flowers, herbs, fiber – whatever you want. Today, urban farms grow plants in the ground in soil, floating in water with hydroponics or aquaponics, or even in the air using aeroponics. Read the full story via Grow Your Interest in Urban Farming « MyMedicalForum MyMedicalForum.